The Desert Willow blooms a beautiful trumpet shaped flower in spring and through the fall that resembles that of the catalpa. The colors of the bloom range from burgundy to pure white with yellow striped throat and all colors in between, this selection has burgundy. 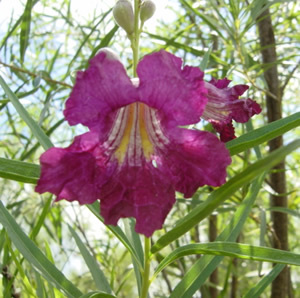 The Desert Willow grows fast and reaches up to 15-25 feet in height and width as well. Chilopsis linearis is a Texas Native.